Tired of spending your precious time slicing mushrooms? 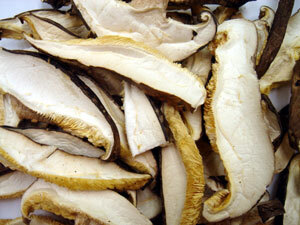 Shiitake-Ya™ brings you Shiitake Slices…Gourmet in minutes! That is correct– Shiitake-Ya™ will now do the slicing for you. No need to sharpen your knives. No need to worry if each slice of shiitake mushroom is equally cut. With our convenient Shiitake Slices, gourmet dishes can now be prepared quicker than ever. Shiitake-Ya™ Sliced Dried Mushrooms are ready to use in an endless array of dishes, ranging from soups, sauces, pasta, chili, omelets, stir-frys, etc. For any recipe that requires mushrooms or to enhance your favorite dish, simply include a handful of Shiitake Slices and you are set for a gourmet meal. For recipes requiring fresh mushrooms, simply re-hydrate the shiitake slices by putting the desired amount in a bowl with boiling water. Cover and steep for about 15 minutes and it is ready to go. For a more robust flavor, save the shiitake stock and use it as a base for soups and sauces. Shiitake-Ya™ Sliced Dried Mushrooms are the perfect food for those who prioritize nutrition without sacrificing time and taste. We invite you to explore the possibilities with our Sliced Shiitake-Ya™ Dried Mushrooms!